If you’re a February bride-to-be, by now everything should have been planned and near done, right? You’ll be surprised to find out that for many brides-to-be choosing their wedding day hairstyle and accompanying hairpiece/s is particularly challenging and ends up as the last thing to be decided upon. Many factors could cause a bride-to-be to change her mind on her hairstyle or perhaps she just isn’t able to find the right fit. If you are that February bride wary of searching for the perfect bridal hairstyle + accompanying hairpiece, you are in luck – but first some tips! When choosing a bridal hairstyle there are a few things to keep in mind. Firstly, as much as you would love to go with the trends, the ultimate satisfaction can only be derived through personal preference. Taste and preference aside, you have to decide on the type of hair accessories to use. Which accessory works best for your wedding gown, pieces of jewellery and overall look? Like with most accessories, the options are almost endless with bridal hair accessories. From bridal comb to clip to headband, tiara, hair vines or pins and more, you’ll have to decide on which of these work best for your bridal beauty look and overall wedding style. You must remember that every aspect of your bridal look works together for good, literally. 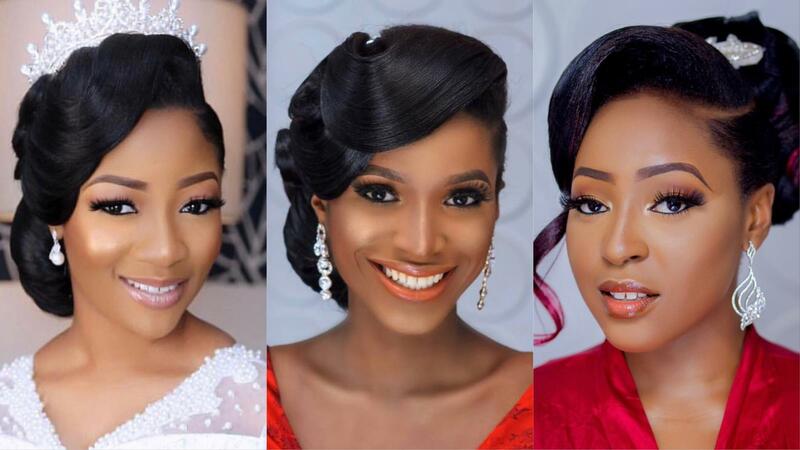 To help make your selection a little less stressful, we’ve curated 7 stunning bridal hairstyles by top Nigerian hair artist, Abd’azeez, popularly known on the Gram as Hairbysleame. These bridal hairstyles and accompanying accessories are timeless, elegant and perfect for brides getting married in this month of love.